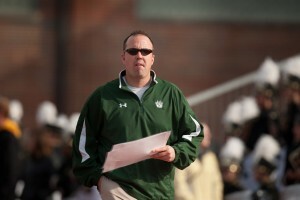 Northwest Missouri State University head football coach Adam Dorrel has been named the AFCA Region 3 Coach of the Year. Dorrel, along with the winners of Division II’s other regions are now eligible for the American Football Coaches Association’s Coach of the Year honors. The winners are selected by Active members of the Association who vote for coaches in their respective regions and divisions. Dorrel has earned AFCA Coach of the Year honors twice, leading Northwest to national titles in 2013 and 2015. This year, Dorrel and the Bearcats captured their fourth-consecutive MIAA title, going 11-0. In six years at the helm, Dorrel has gone 74-8 with a 57-5 MIAA mark. He has made the NCAA postseason all six years, compiling a 13-3 playoff record.